Journalist Remona Aly has long been intrigued by many aspects of motherhood. While not a mother herself, she relates to the lived experiences of women she knows and, in this programme, considers the symbolic, mythological and religious incarnations of mothers throughout history. She details the more relatable elements of the Virgin Mary’s motherly experiences described in the Quran, such as her vulnerability when giving birth to Jesus alone, and the pain of labour which makes her wish for death. Remona also considers how places as well as people bear children and reminisces about her links to her own motherland, India. Remona examines the sorrow and conflict that can come with motherhood. She describes the impact of not having children herself and the loss of a newborn, and revisits the Ancient Greek stories of Medea and Pandora, who bring death and destruction. The wonders of motherhood are also explored, highlighted by neurological research which documents the re-wiring of women’s brains during pregnancy, and the strong bonds between mothers and infants in the animal kingdom. Throughout, Remona contemplates the notion of God in the maternal paradigm and concludes that the power of motherhood moves between beliefs, from the divine down to a human level. 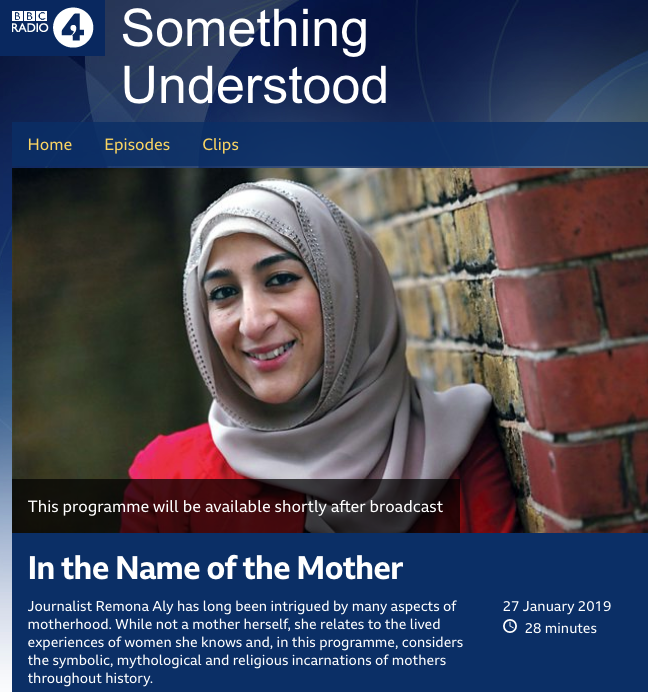 Free from years of patriarchal influence, Remona argues that it is time to reclaim the mother’s position in society, and ponder prayers that begin ‘In the name of the Mother…’.